You might not always approach your Twitter strategy with your website in mind, but it’s time you start. Twitter is a powerful platform in its own right, but you have to consider how many people find your business through other means, such as Google search. Sometimes consumers will stumble upon your website before your Twitter profile. So how can you connect the dots between your site and social presence? A great way to bridge the gap is by taking advantage of Twitter’s embedding functionality. From buttons to embedded timelines and tweets, you can introduce visitors to your more social side without ever having to leave your site. Here’s how you can embed your Twitter feed — and everything else Twitter-related — on your webpage. One of the easiest ways to display your Twitter presence on your webpage is through a plugin or widget. And there are several options available to you depending on your content management system. WordPress offers dozens of Twitter plugins for your website or blog. Here are just a few of our favorites. WP Twitter is an all-inclusive plugin that creates a complete integration between your WordPress blog and Twitter account. 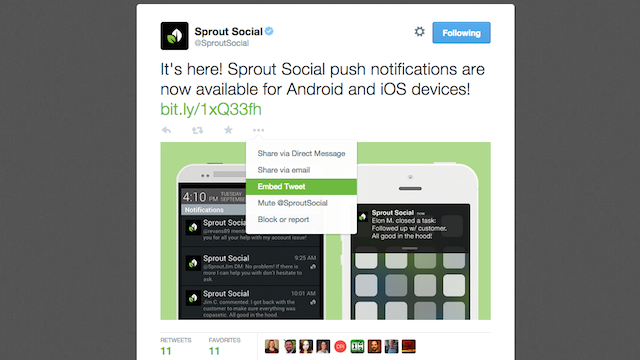 You’ll have access to everything from Twitter buttons to Twitter profile and search widgets. This Twitter widget is easy to configure and can be styled to match the theme of your website or blog. It uses the Embedded Timeline widget available through Twitter.com. Here’s another easy-to-use Twitter feed widget that lets you display your latest tweets. You can implement it in just a few clicks without having to copy and paste any code to your site. This plugin provides a simple interface on which to display your tweets in a clean and organized way. You can customize the link color, border color, and background to make it fit the style of your site. If you don’t need any extra bells and whistles for your sidebar, this is an ideal option. Compared to WordPress, Blogger and Tumblr’s plugin libraries are much smaller; however, that doesn’t mean you’re without options. If you’re using a CMS other than WordPress, here are a few additional, and more manual, ways of embedding Twitter on your website. You can add buttons to your website to help your visitors share content and connect with your brand on Twitter. These buttons can live on your homepage, in headers and/or footers, or on each individual page or blog post. Regardless of the option you choose, you’ll be required to copy and paste the provided code into the HTML for your site. It’s best that someone from your design or developer teams get involved at this point. A great way to showcase your content, expand your reach, and grow your social community is through embedded tweets. These fully functional tweets are displayed on your website or blog, and only require a few simple steps. The embed code can be used to display all kinds of tweets, including ones with photos, videos, or Twitter Cards. It also works with tweets that are part of a conversation. We should note that only photos from pic.twitter.com and videos from YouTube will be automatically displayed on embedded tweets. When a single tweet won’t do, try embedding a collection of tweets instead. Embeddable timelines make it easy to syndicate any public Twitter timeline to your site with a line of code. And just like timelines on Twitter.com, embeddable timelines are interactive and enable your visitors to reply, retweet, and favorite tweets directly from your site. User Timeline: Display public tweets from any member on Twitter. Favorites: Show all tweets you or a specific user has marked as favorite. List: Shows tweets from public lists that you own and/or subscribe to. Search: Displays customized search results in real time (perfect for live events or branded hashtags). As of March 2nd, you can highlight Twitter-hosted video on your website with the new embedded video widget. Video embeds are available for videos uploaded through Twitter’s official mobile apps for iOS and Android, as well as Twitter Amplify partners. Only the video will appear within your post, but viewers can access the full, original tweet by clicking on the Twitter logo in the lower right corner of the video. Just make sure that this option is checked when you first access the embed code. Each of the embedding options above can be used in conjunction with one another; there’s no right or wrong way to implement them. Just ensure that you’re providing relevant and interesting information for your readers. For more Twitter inspiration and a round-up of lesser-known features, read our earlier article: 4 Surprising Twitter Features Every Marketer Should Use. Once you’ve got your feature set established, read more about the Twitter metrics you should be tracking to ensure your business goals are being met.